When I was about 18 or so, I had a brief fantasy that I would somehow meet and marry Prince William. 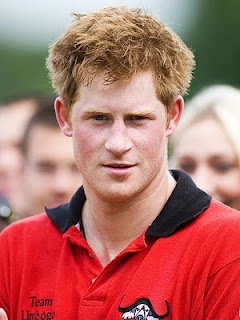 That was when he was a cute polo player and not going bald. I'm not sure how or where I was going to meet him, but apparently I thought briefly that "anything could happen," and I could be the next Queen of England. In the words of Cher Horowitz, "as if!" I'm sure that even if William and I had met and fell in love, the Charles and the Queen would not have allowed a, gasp, American to join the royal family! Now that he and Kate Middleton are finally engaged, I am gearing up for the media storm that will ensue as their wedding draws closer. If it is televised, I will DVR it. I just hope that their marriage will last longer and be a happier one that that of Will's parents. I wonder what it is like to have the rest of your life set up with the answer to one simple question? I don't envy here-- the media will follow her everywhere, her life, her family's life and the life of her future children will be subject to public eye and she will not be able to yawn in public ever again! I do wonder what her pet charity cause will be...apparently she works in fashion -- so, fashion victims? Ha. I know, bad joke. Love it! OMG! I was such a princess diana junky! I used to get all these books about here from the library. I am sure I wrote a paper about her in school! Ummm...I used to have the same fantasy. My best friend and I actually went to Kinkos (she turned 16, had a car, and we weren't allowed to go very far)to make a Prince William calendar. His face hung on my teenage bedroom wall for a full 12 months. I wanted to enroll at his college. And to think, it really could have been me. Commoner.